The markets of Srinagar offer a vast variety of the most refined crafts – from pashmina shawls, as light and soft as the breeze that blows across the Dal, to intricately handwoven carpets, delicately carved woodwork and glittering copperware. Epicureans will delight in the rich Kashmir cuisine: from melt-in-the-mouth gushtabas to irresistible walnut tarts, or even a handful of warm, roasted chestnuts cracked open in the sun. For those who wish to squeeze a little more of Kashmir into their stay, Srinagar is within comfortable driving distance of several popular sites. Gulmarg's legendary beauty, prime location and proximity to Srinagar naturally make it one of the premier hill resorts in the country. Originally called 'Gaurimarg' by shepherds, its present name was given in the 16th century by Sultan Yusuf Shah, who was inspired by the sight of its grassy slopes emblazoned with wild flowers. 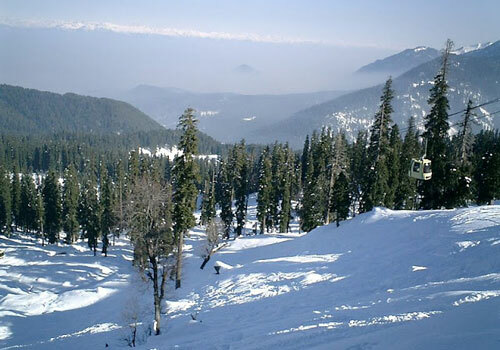 Gulmarg was a favourite haunt of Emperor Jehangir who once collected 21 different varieties of flowers from here. Gulmarg has the highest green golf course in the world, at an altitude of 2,650 m, and is the country's premier ski resort in the winter. The journey to the enchantment of reaching there-- roads bordered by rigid avenues of poplar give over to flat expanses of rice fields interspersed with picturesque villages. Depending on the season, nature's colours could be the translucent green of spring, summer's rich emerald, or autumn's golden hues, when scarlet chillies festoon windows of village homes. Situated at the confluence of the streams flowing from Sheshnag Lake and the Lidder river, Pahalgam (2,130 m) was once a humble shepherd's village with breathtaking views. Now it is Kashmir's premier resort, cool even during the height of summer when the maximum temperature does not exceed 250°C. A number of hotels and lodges cater to all preferences and budgets, from luxurious hotels to unpretentious trekkers' lodges. 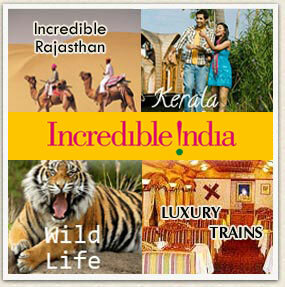 The most beautiful of these is the huge, undulating meadow of Baisaran, surrounded by thickly wooded forests of pine. Hajan, on the way to Chandanwari, is an idyllic spot for a picnic. The drive to Sonmarg is through the Sindh Valley which presents yet another spectacular facet of countryside in Kashmir. Situated at an altitude of 2730 m, Sonmarg ('The meadow of gold') has, as its backdrop, snowy mountains against a cerulean sky. The Sindh River that meanders through the valley abounds with trout and mahaseer. Ponies can be hired for the trip up to Thajiwas glacier, which is a major local attraction during the summer months. Sonamarg is the base of a major trek that passes along several mountain lakes -Vishansar, Kishansar, Gadsar, Satsar and Gangabal. 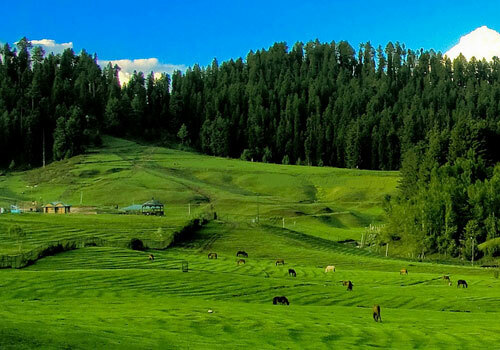 Yusmarg in Kashmiri means The Meadow of Jesus. It is believed by the natives that Jesus came to Kashmir and stayed at Yusmarg for some time. 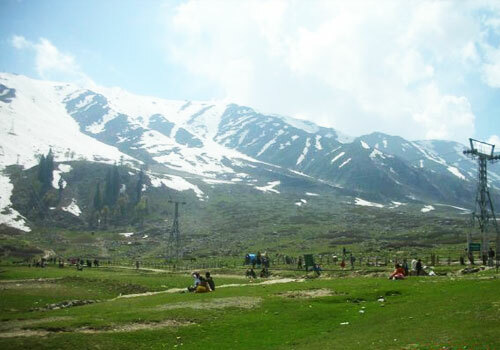 It is an alpine valley covered with snow clad mountains and the meadows of Pine and Fir, It lies 13 km south of Charari Sharief a town of Budgam district of Jammu and Kashmir. 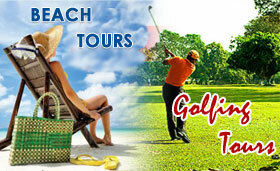 It is situated at the bank of Doodganga River which is a tributory of Jehlum River. 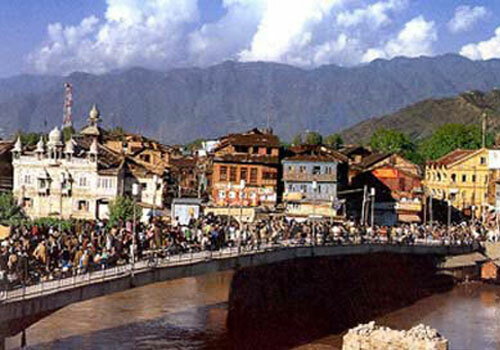 It is a popular tourist destination, nestled with in the imposing Pir Panjal peaks, a sub range of Himalaya. The Peaks are: the Sunset Peak and the Tatakooti Peak for which the expeditions lead from this hill station. 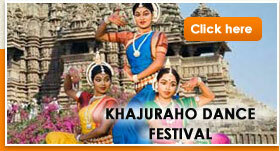 It lies at an altitude of 2396 metres above sea level. 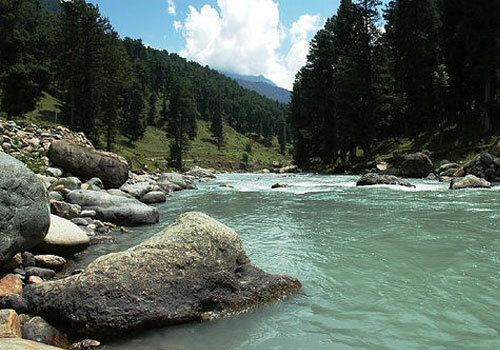 Verinag is named after Nila Nag, the son of the wise saint, Kashyap Rishi, who reclaimed the Kashmir valley, the original shape of this spring was in the circular form of a kund. In 1620, the Emperor Jahangir had the shape changed into the traditional Mughal octagonal. The spring, which has a circumference of 80m in enclosed today by a brick wall under which are vaults. These lake – like waters have a limpid clarity in which the verdant surroundings of pine trees are mirrored. 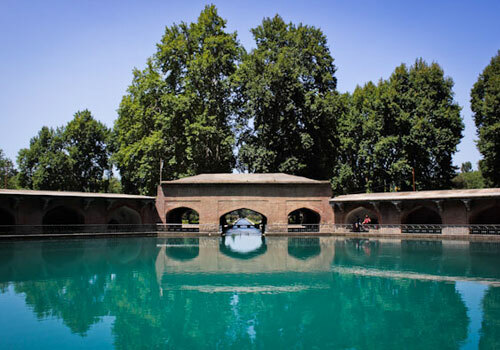 Fish swim in the cool depths and this picturesque setting that so captivated the Mughal emperors has lost none of its pastoral charm over the centuries. The lawns around the spring are a beautifully manicured green, and banks of massed flowers add splashes of colour to this symphony of greens and browns. 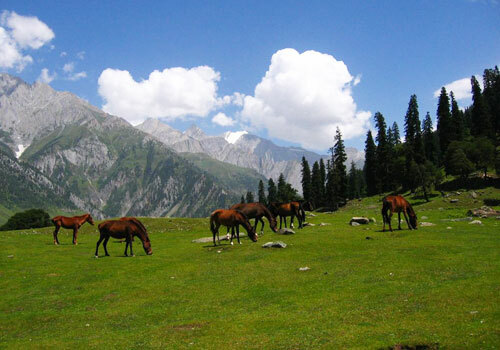 A highland meadow, just 4 km from Gulmarg, Khilanmarg is accessible by foot, by pony or in a dandi. From here, the view of the snow peaks and the limpid waters of the Wular Lake is a breathtaking one, unfolding view upon view of Himalayan splendour. Khilanmarg offers an unparalleled view of the great Himalayan range. The Apharwat peak leads to the Alpather Lake, a picturesque alpine lake that remains frozen until late June. For horse riding freaks, Alpather Lake makes an exciting day's excursion. Slightly lower than Gulmarg is the shrine of Baba Reshi (a Muslim mystic saint) visited by people of all faiths.